Thousands of unforgettable songs of Mohammad Rafi, sung in an unmatched mellifluous voice, have created a unique world of Melody and Music, which has become a pious abode for millions of his fans and music lovers alike. This world has no geographical boundaries; music is its religion and credo: Rafi is its presiding deity and the vast number of his fans his ardent devotees. To explore this world is a great challenge for any music lover. We, as a group of writers, are determined to present the entire spectrum of this world to legions of his fan and music lovers across the world. After the remarkable success of the first biography (Title: Meri Aawaz Suno) of the legendary singer, we are going to publish a pictorial coffee table book on Rafi Sahab and the world of melody created by his eminently hummable and immortal songs that continue to haunt generation after generation. 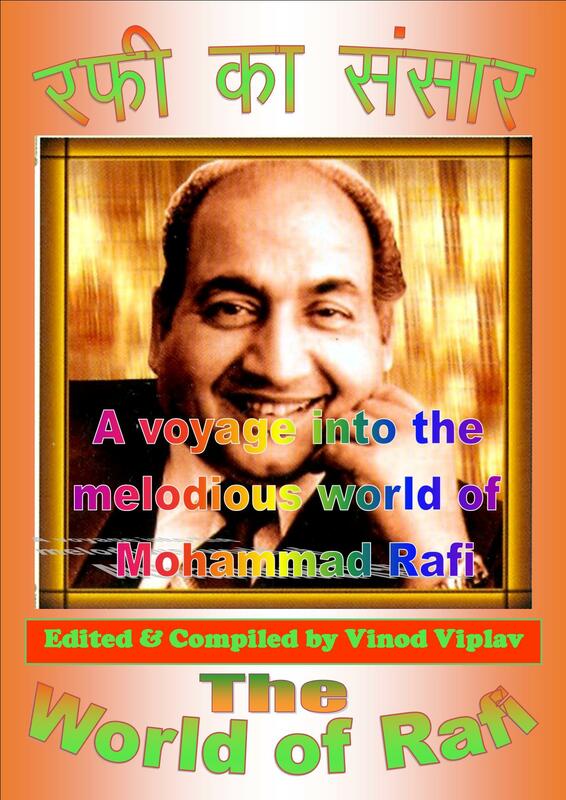 This book, titled “World of Rafi / Rafi Ka Sansar – A Voyage into the Melodious World of Mohammad Rafi” – will be a collection of select articles (with pictures) on various facets of his life, the incredible range of his voice, the phenomenal repertoire of songs encompassing all genres of music and a huge fan following from across the world cutting across gender and age barriers. Articles will be written by famed musicologists and film journalists and writers like Mr. Amarjit Singh Kohli, a music promoter and chairman of Sakha; Mr. Pankaj Vohra, senior journalist; Mr. Zia us Salam, a film critic; Mr. B B Nagpal, a senior film journalist; Mr. Binu Nair, Founder, Rafi Foundation; Mr. R P Sinha, a musicologist; Mr. Choudhary Zia Imam, author of the biographies of Mohammad Rafi and Naushad Ali; Mr. Vishnu Khare, former editor of Nav Bharat Times; and Mr. Jawari Mal Parakh, a film critic. Besides, some ardent Rafi fans like P. Narayan, G. B. Mathur, Sanjeev Kumar Dixit and Umesh Makheeja will also chip in with their articles. A distinctive feature of the book will be a directory of the fans of Rafi Sahab, containing details about organizations, memorial clubs and fan clubs / groups with their introduction, pictures, address and contact details. This book will be published by Sachi Prakashan, which has also brought about the first biography of the singer. There will be more than 400 pages with a number of coloured and B/W pictures of Mohammad Rafi. If anyone wants to write an article, he or she can inform me. It will better to discuss the subject before writing the article. We are planning to release the book before or on the death anniversary of Rafi Sahab at a function to be organised in New Delhi. We are confident that the large number of fans of the iconic singer will place order for the book in advance. We also appeal to you to inform any other Rafi fans you know of about this venture. You may send your details with your picture, address, contact details and your impressions of Mohammad Rafi and his music. To know more about book and sending intries, please visit here. This entry was posted on Sunday, April 13th, 2014 at 5:57 pm	and is filed under The Rafi Foundation. You can follow any responses to this entry through the RSS 2.0 feed. You can leave a response, or trackback from your own site. Dear Vinod ji very glad to know that you are coming with an another book on great rafi saab. When and where we can get this book ? Please let us know. Long live rafi saab. A GREAT EFFORT..HOPE IT WILL HAVE INTERVIEWS OF THOSE LEGENDARIES WHO HAD AN OPPORTUNITY TO WORK WITH HIM OR WATCH HIM CLOSELY.. I live in England and am also interested in purchasing a copy, I am so pleased that a book on the great legend will be published this will hopefully not only please millions of his fans but keep his memory alive. A a good introduction to the younger generation not that the great Mohd Rafi really needs an introduction. Please give more details about where and when this book will be available. All the Best to Vinod Viplav the Pilot of the Project. His credentials are SOUND – for he already published a book on Rafi saab in 2007. From Mumbai – the Rafi Foundation Trust Welcomes the Book and hope it will be a Collector’s Delight. looking forward to meeting all rafi bakths at the book launching;we are a different breed altogether. It is heart-thrilling to know that the book is being published on our beloved Rafi Saab. pl. let me know the amount I need to send for the book and tell the address where I should send Demand Draft payble at Mumbai. I keenly wait for the reply. Congrats to all Rafi Fans. It is very great pleasure to know that the RAFI FOUNDATION is being released a book shortly in memory of our great singer. Definitely I will procure one copy of this book on its publication. I have already held a copy of book “MOHAMMAD RAFI – HAMARE ABBA – KUCH YADEN” . Many many congratulations and wishes to all personnel for their contributions to this book. The first biography of great legendary singer Mohammad Rafi – Meri Awaz Suno” was was first published in 2007 in Hindi by Sachi Prakashan. This book was release on July 30, 2007 on the eve of 27th death annivarsary of Rafi in a function organised at Punjabi Bhawan, New Delhi. This book got overwhelming responses and appreciations from its readers and all copies of the first edition of this biography sold within a days and publisher of this book was forced to publish its 2nd edition. Its 2nd Edition was published in 2008. Now its 3rd Edition is going to publish. The original book was published in Hindi. Now translated versions of this book are going to be published in different languages including Urdu, Bangla, Malayalam and English. all the best ,vinod ji . many many congratulation to you for this book . After the remarkable success of the first biography (Title: Khoya Khoya Chand) of the legendary singer, we are going to publish a ‘Table, Tea & Rafi’ book on Rafi Sahab and the world of melody created by his eminently hummable and immortal songs that continue to haunt generation after generation to come and memorize in our heart. We follow you, We have faith on you Rafi Sahab more than any prophecies. PYAARE RAFI BHAGTO. MUJHE YE DEKH KAR BADI KHUSH HOTI HAI KE AAP APNE PYAARE GAYAK RAFI SAHAB KI YAAD KISI NA KISI ROOP MEIN YASD TAZA RAKHTE HEIN. KABHI GA KAR KABHI KAVITA SUNA KAR KABHI SAFERNAMA LIKH KAR KABHI KUCH KABHI KUCH AAP KARTE HI RAHTE HEIN. AAJ IK AUR BADI KHUSHI KA MOKA AAYA HAI KE RAFI SAHAB PAR IK KITAB CHAPNE JAA RAHI HAI MAIN ISKE LIYE SABHI RAFI FANS KO BADHAAI DETA HOON. AUR MAIN CHAHTA HOON KE SILSILA KABHI RUKE NA. NAYE NAYE GAYAK AATE JAYEIN AATE JAYEIN AUR GAATE JAYEIN GAATE JAYEIN. Rafi Fans are requested to send their short profile (introduction) with their picture, address and contact details. They may send artilces and tributes to Mohammad Rafi. best of luck. what is the price and how to buy this book. I am a die hard fan of Mohammad Rafi. can i send my article for this book. how i can place order for this much needed book on our beloved singer. It will indeed be a reviewed homage to the greatest singer the world of music has ever produced .